Beverly City Hall is located at 191 Cabot Street, Beverly, MA 01915; phone: 978-921-6000. Photo: John Balch House, ca. 1679, 448 Cabot Street, Beverly, MA Listed on the National Register of Historic Places in 1973. Photographed by User:Daderot (own work), 2005, [cc-by-3.0 (creativecommons.org/licenses/by/3.0)], via Wikimedia Commons, accessed September, 2017. 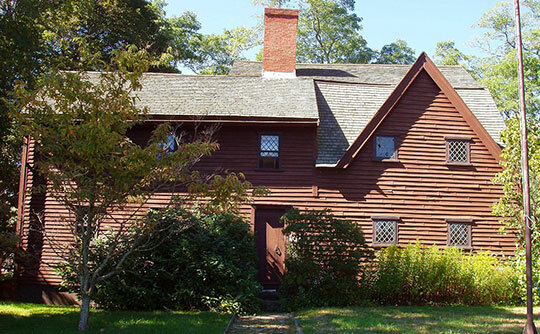 Beverly was a part of Salem until 1668 when it was incorporated as an independent town. John and William Woodbury and Roger Conant were among the first settlers. The first meeting house was built about 1656, with Reverend John Hale as pastor. (John P. Hale, Nathan Hale and Reverend E. E. Hale are numbered among his direct descendants.) A second church was established in 1713 with Reverend John Chipman as pastor. The principal industry in 1880 was the manufacture of shoes and boots.